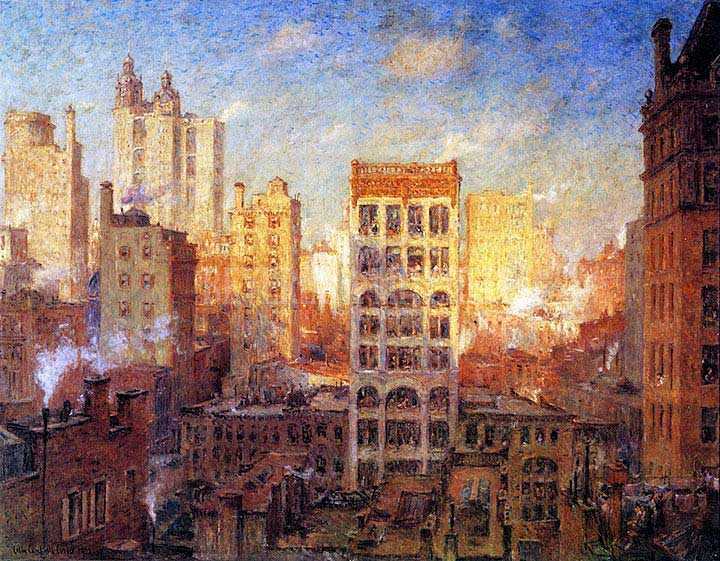 Overshadowed by social realist painters and then the abstract movement early in the 20th century, Colin Campbell Cooper never quite got his due. But his evocative takes on New York’s streetscapes and skyline reveal a fascination with the bigness of the city’s architecture contrasted against the smaller personal stories of millions of anonymous New Yorkers. The bigness you notice first, especially with paintings like the “Mountains of Manhattan” (top) and the “Cliffs of Manhattan” (second), which both depict the city as an awesome and mighty wonder along the lines of the Rockies or the Alps. 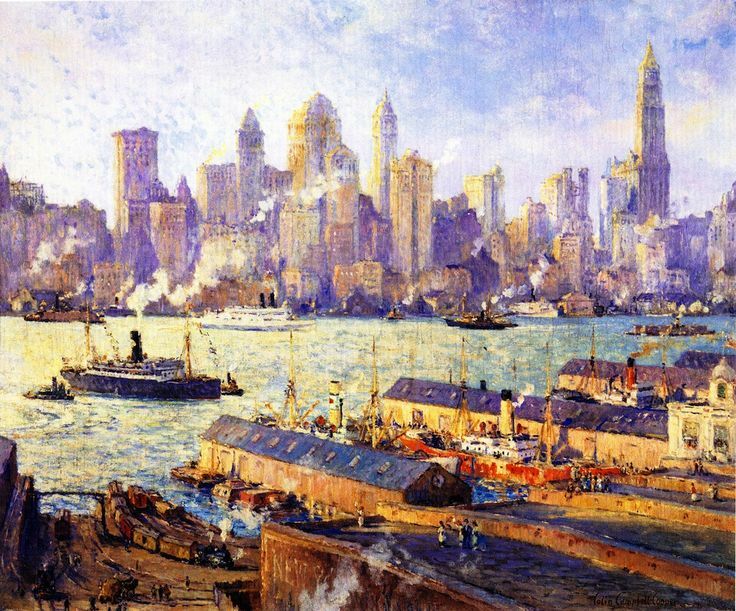 When Cooper contrasts the big and the small, as he does here in 1917’s “South Ferry,” he gives us a more humanistic view of Gotham. We may not be able to read their faces, but every one of those trolley riders ans sidewalk vendors has a story. 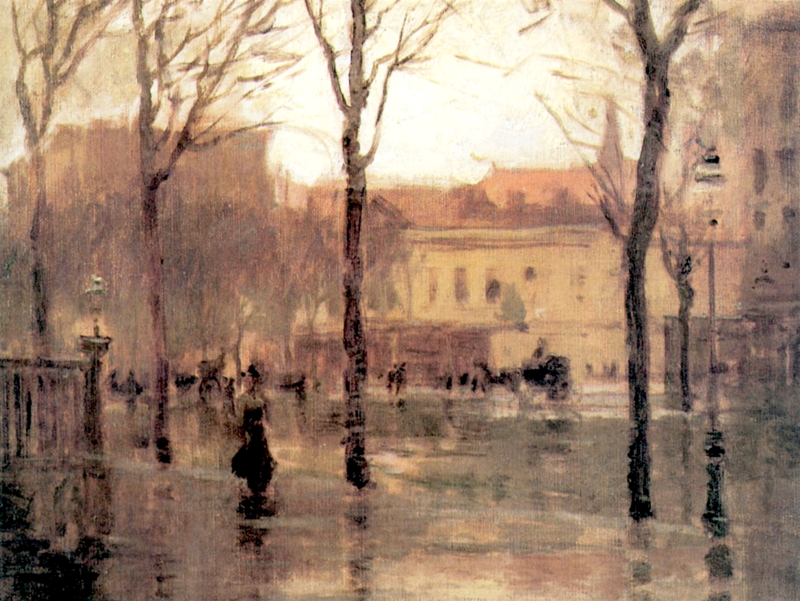 “Chatham Square,” above, from 1919, is similar. 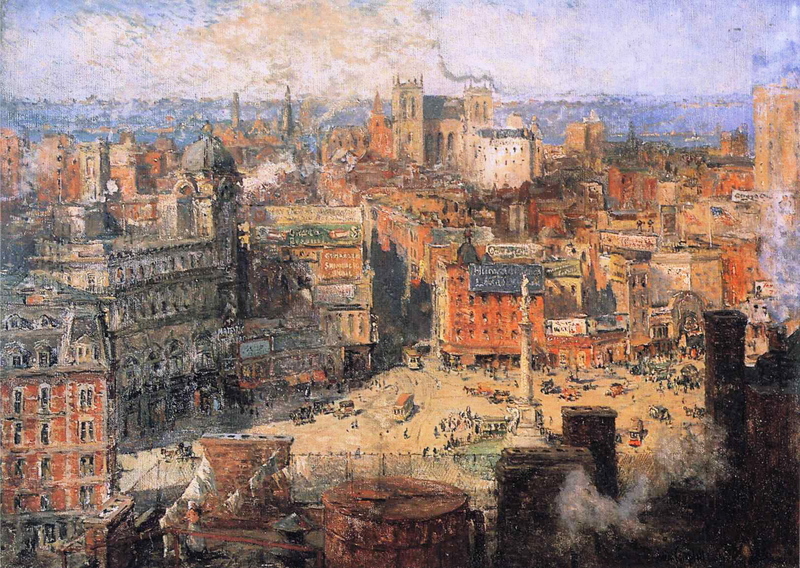 The city’s skyscraper mountains are in the background, while the day-to-day life, its human side, is in the forefront. 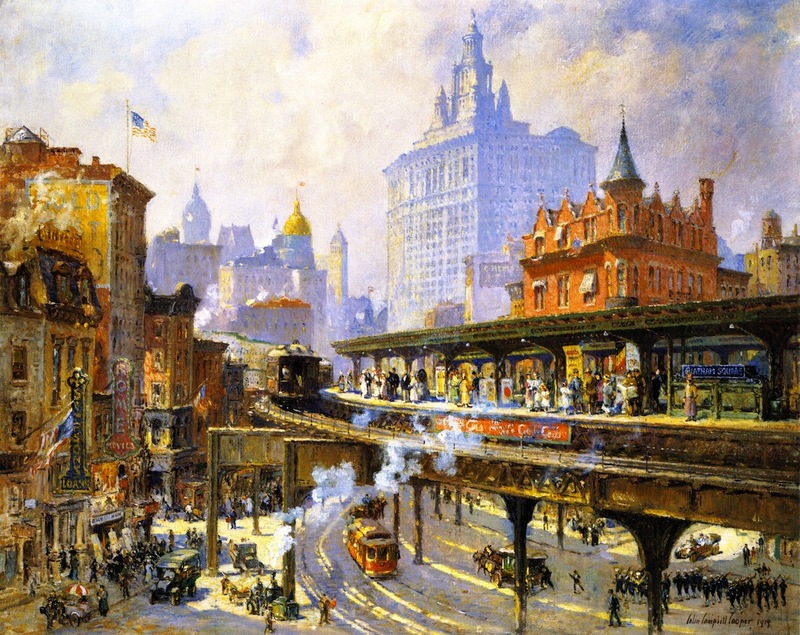 Commuters wait for the elevated train to pull in, soldiers march under the tracks, and movie houses attract crowds on the sidewalk. We don’t have to be able to see them up close to know they are us. 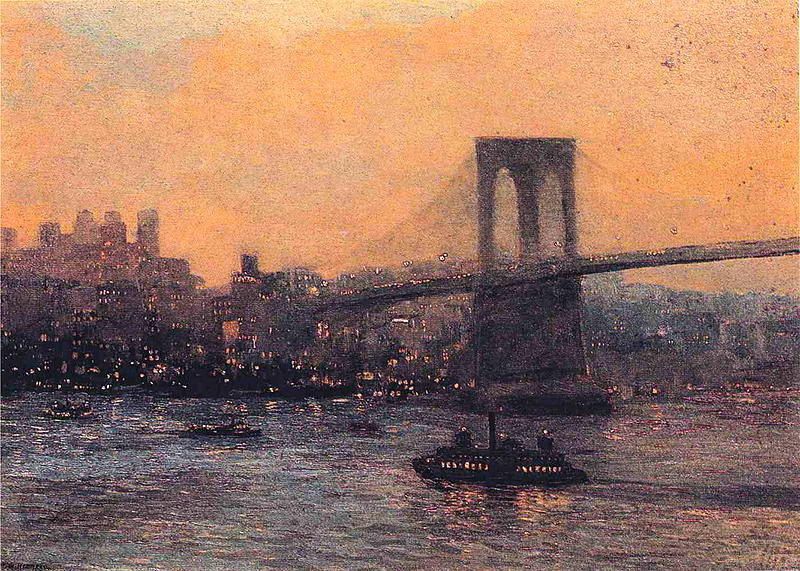 “New York From Brooklyn” gives us a more detailed and personalized County of Kings. Meanwhile, Manhattan across the river is muted, as if it’s an impenetrable fortress. 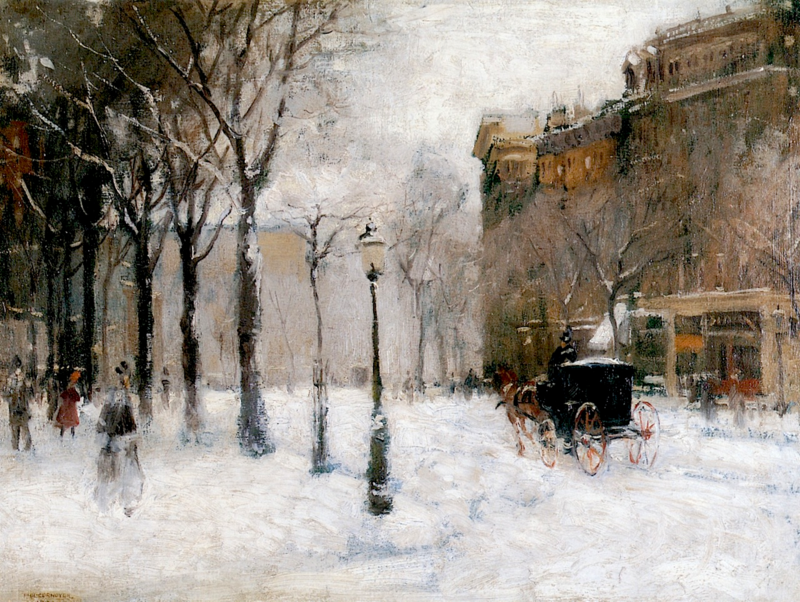 Cooper lived in New York from 1904 to 1921. 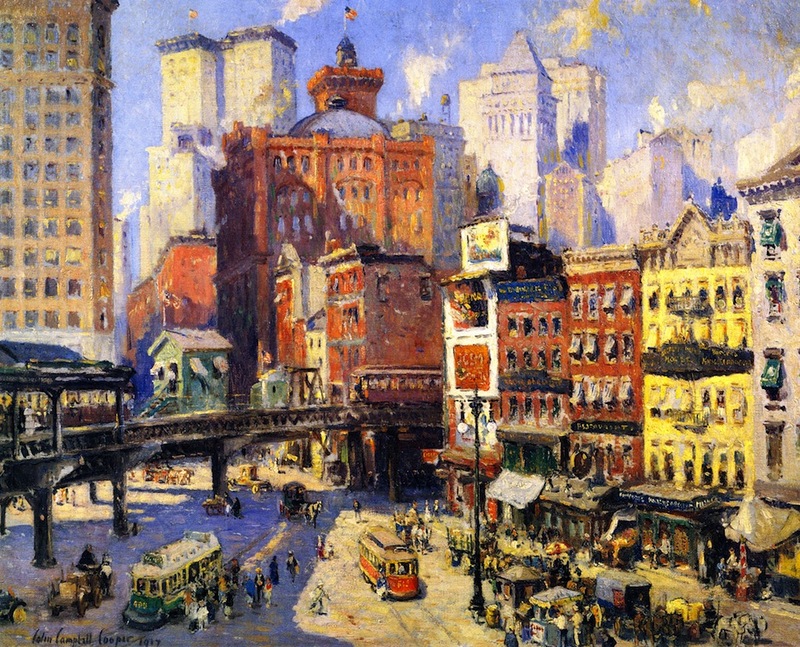 “My pictures are built on these contrasts,” he once said of the juxtaposition in many of his paintings of older, smaller-scale buildings and the modern skyscrapers dominating the skyline. “Columbus Circle” (above), completed in 1923, illustrates this perfectly. 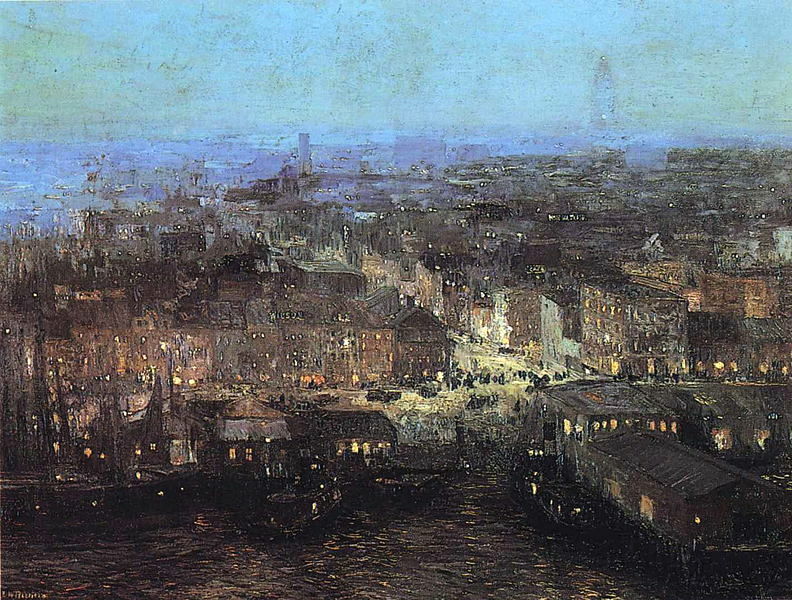 I haven’t been able to find out very much about Edward Willis Redfield, the Impressionist painter behind these three scenes of the city as it slips from day to night. 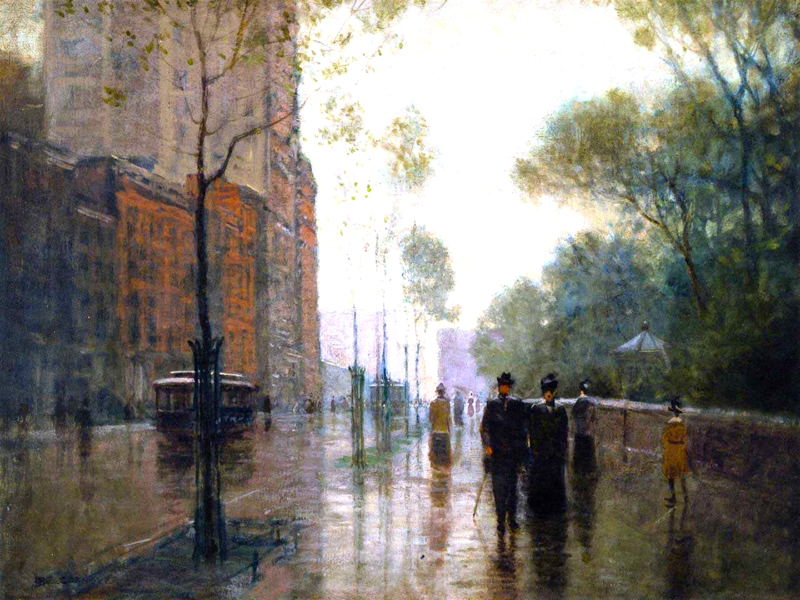 Born in 1869 in Delaware, he studied in Philadelphia and Paris during the Gilded Age and after the turn of the century gained fame for his landscapes of rural Pennsylvania and Maine. 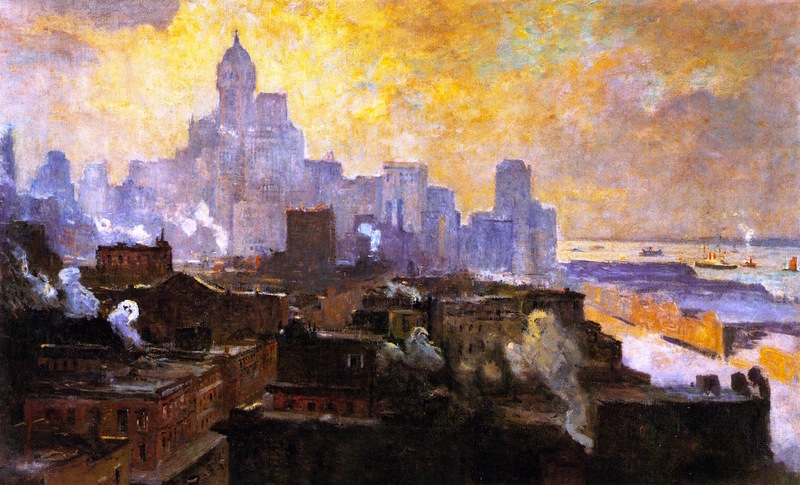 Redfield spent some time in New York City around 1909. 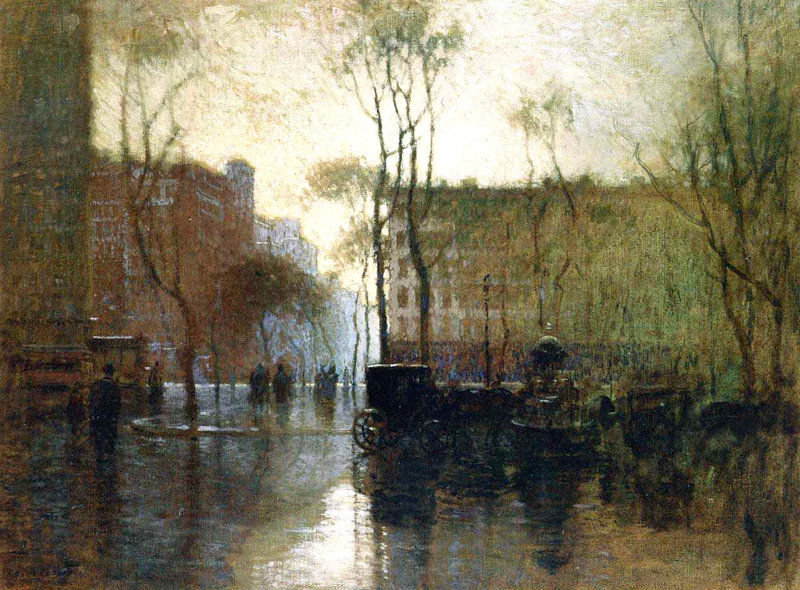 What comes across in these three paintings from his time in the city is a deep enchantment with the landscape of Lower Manhattan at twilight. 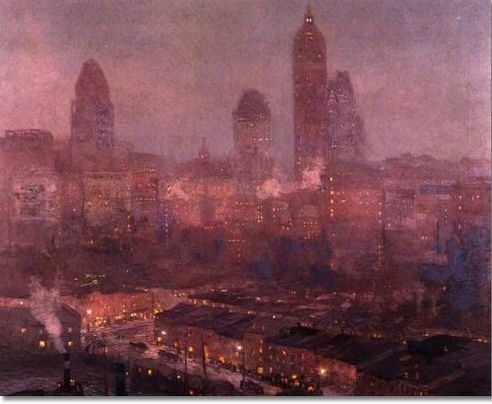 His depictions of the twinkling lights of the city under the dreamy, magical colors found only at the mysterious time when evening chases away the day are beguiling.